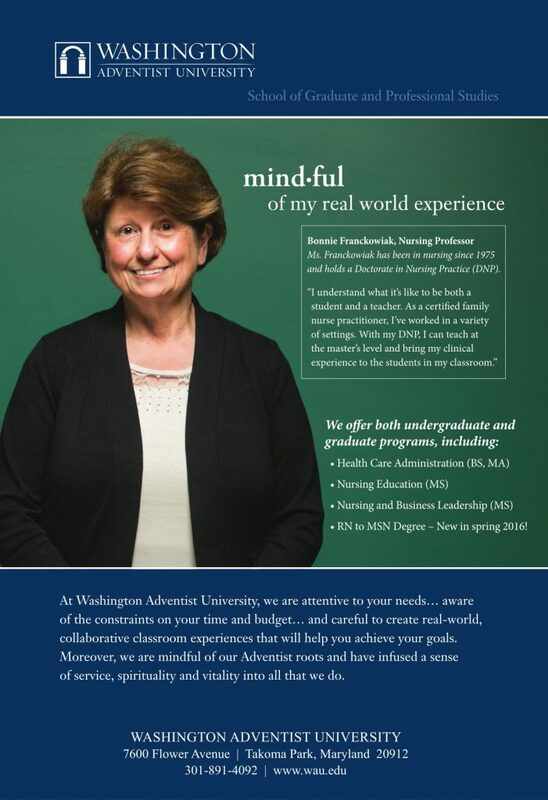 Kinetics MarCom has been responsible for all outreach related to the enrollment for Washington Adventist University School of Graduate and Professional Studies in Takoma Park, Maryland since 2014. 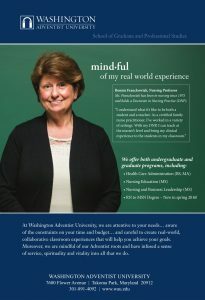 Washington Adventist University is the only private four-year higher education institution in Montgomery County, Maryland. 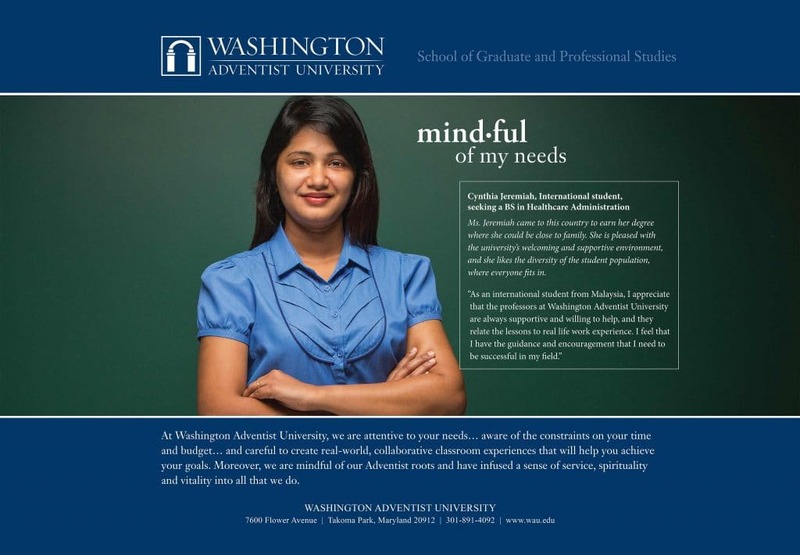 The School of Graduate and Professional Studies is designed for adult learners in the DC-Metro area who want to extend their education, earn a degree or find intellectual stimulation through nearly 20 different programs. 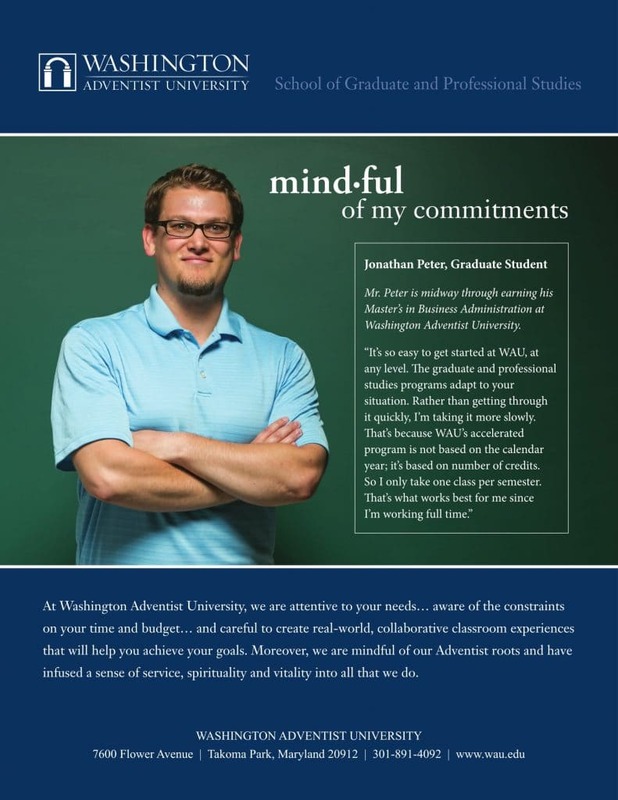 Washington Adventist University approached Kinetics MarCom to help with their re-branding effort and their strategic communications plan and development. First, our team engaged in qualitative research that consisted of one-on-one meetings and focus groups. 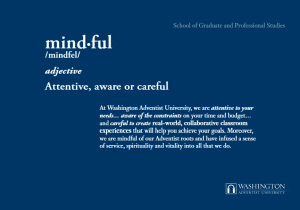 With a sampling of 35 students, faculty and school administrators, we were able to identify the key attributes that make the School of Graduate and Professional Studies so unique and appreciated by its students and faculty. These key attributes became important in the strategic planning process of this project because it enlarged our scope of insights and gave us a fresh perspective. Second, we conducted a series of strategic exercises that’s a part of our proprietary planning process – COPP™. This process helps us to devise key components of the strategic communication plan. These exercises and discovery process tools help us remain objective so we don’t make incorrect assumptions about the school’s strengths, weaknesses, image attributes and target audiences. We also established a re-branding recommendation and long-term strategic communication plan. This included a recap of our key findings from the research phase of the project; results from the strategic exercises and discussions, high-level recommendations of target audiences and their needs and wants. 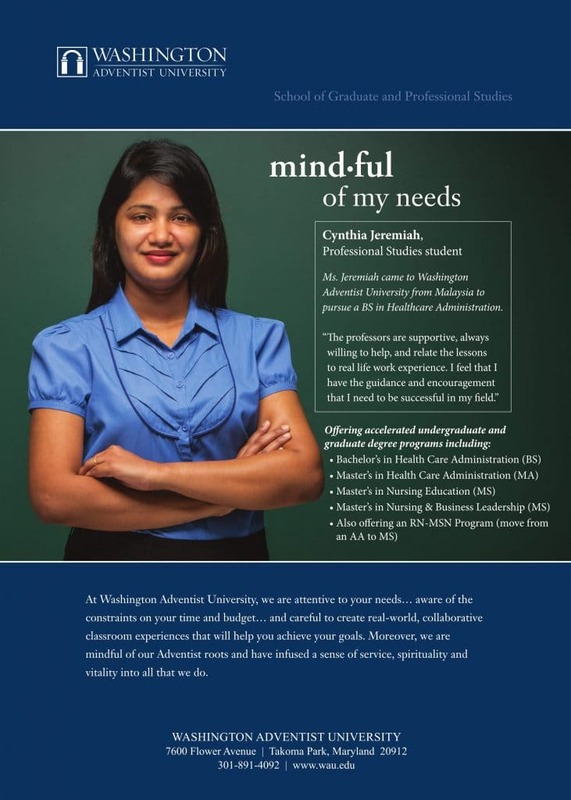 Other items we employed consisted of the execution of new communication materials, a new view book, enrollment emails targeted to specific audiences, social media posts, TV and print ad production and placement and integration into the school’s CRM. As a result of our work, the School of Graduate and Professional Studies has seen a cumulative 21% increase in enrollment for the past three academic years. Because of our success and great working relationship, we were also tasked with helping the dean of students re-launch their nursing program and introduce a new respiratory care program.